Kai Khusraw Giving His Testament was removed from a volume of the Persian national epic, the Shahnama, executed for Sultan Mirza Ali, ruler of Gilan. This enormous manuscript once contained about 350 miniatures, which are now dispersed. Rendered in one of the manuscript's two distinct painting styles, the Worcester page exemplifies the "big-headed" type, named after its most singular characteristic. Although no artists' names are recorded, the scribe is Salik ibn Said. 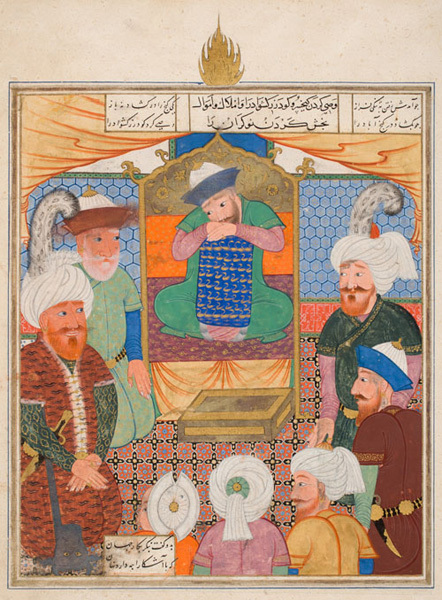 The literal translation of the title given in the text over the painting is "Kai Khusraw appointing Gudarz-e Keshvad executor and distributing properties and possessions." The Shahnama relates that Shah Kai Khusraw sank into depression after defeating all his enemies and was told by an angel in a dream to depart this world. Despite the pleas of his courtiers, he dictated his last wishes and vanished in a snowstorm. Here the depressed ruler is shown surrounded by seven warriors.